The path to a first Symetra Tour victory for the Northern Ireland player wasn’t simple, however. After 36 holes, both Meadow and Carleigh Silvers (Martinsville, Indiana) were tied for the lead at 4-under par overall. On the first sudden-death play-off hole (No. 18), Meadow drained a 40-foot putt to put the pressure squarely on Silvers, which proved to be the deciding factor. Entering the final round, Meadow sat tied for fifth at 2-under par. She was seven shots back of 36-hole leader Jenny Haglund (Karlstad, Sweden), who limped to an 8-over par (80) finish, ending tied for seventh at 1-under. Meadow erased an early double bogey on No. 6 with two birdies to shoot even par going out. Then the back nine started tough with a bogey on No. 10, but she remained calm and found her way to birdies on Nos. 13, 16 and 18. Two groups behind Meadow was Silvers who, for a brief moment this afternoon, took the outright lead at 4-under par thanks to a birdie on No. 16. From there, the two went back and forth. Meadow then tied Silvers at 4-under with her birdie on No. 18, just before Silvers snagged a one-stroke advantage back with a birdie on No. 17. However, her bogey on the final hole led to the playoff. It is the first Symetra Tour win for Meadow, the former four-time All-American at the University of Alabama. 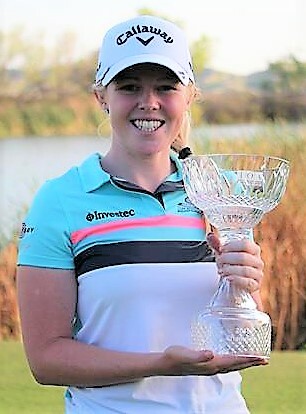 The victory is also the first on the Symetra Tour for a woman from Northern Ireland. “It has been a long road for me so the hard work pays off,” Meadow said. “It just feels amazing right now.